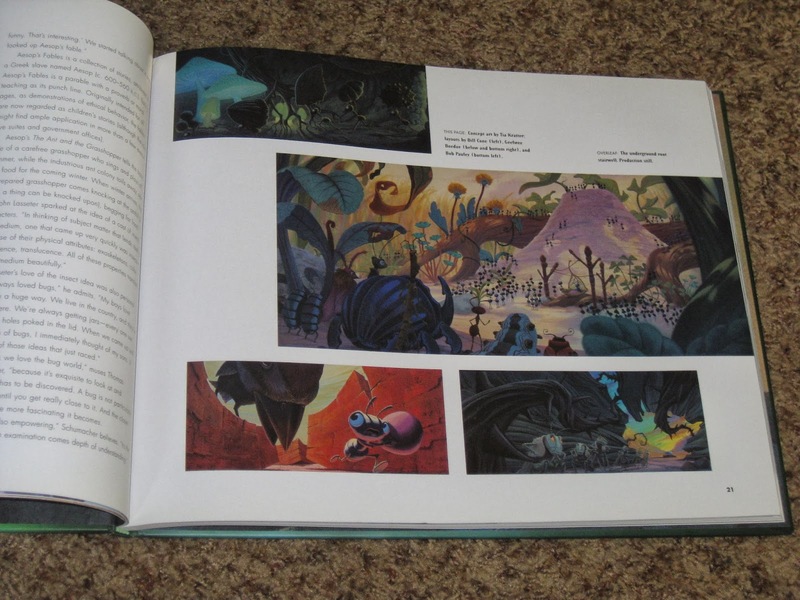 Yesterday I was thrilled to get this in the mail..."A Bug's life: The Art and Making of an Epic of Miniature Proportions" hardcover book! If you're familiar with the "The Art of _________" books by Chronicle Books Publishing, you know that they are some of coolest, most informative books out there when it comes to the art and making of Pixar films. This book, however, came out before that series began so it is not connected with that line (which started with "The Art of Monsters Inc." in 2001). It is though, just as detailed and informative as the Chronicle "The Art of" books (if not more) and goes perfect with the rest of the collection. This book (from Hyperion Publishing) was released in 1998 around the time of the film's release. It's written by Jeff Kurtti and includes over 300 beautiful, full color pages that include exactly what the book title says—lots of art and insights into the making of the movie. This book had a pretty standard price tag of $40.00 when it was released but can be found online now for much cheaper. You can find this book used (in good condition) for as low as about $10.00 on Amazon (and eBay periodically) but if you want brand new condition, be willing to fork out $50.00. I was really impressed on how big this book was when it came! As you can see below in the comparison picture, it's quite a bit bigger than the more recent "The Art of" books. Also, something else I didn't expect is that it has a 3D lenticular cover! Very cool touch. 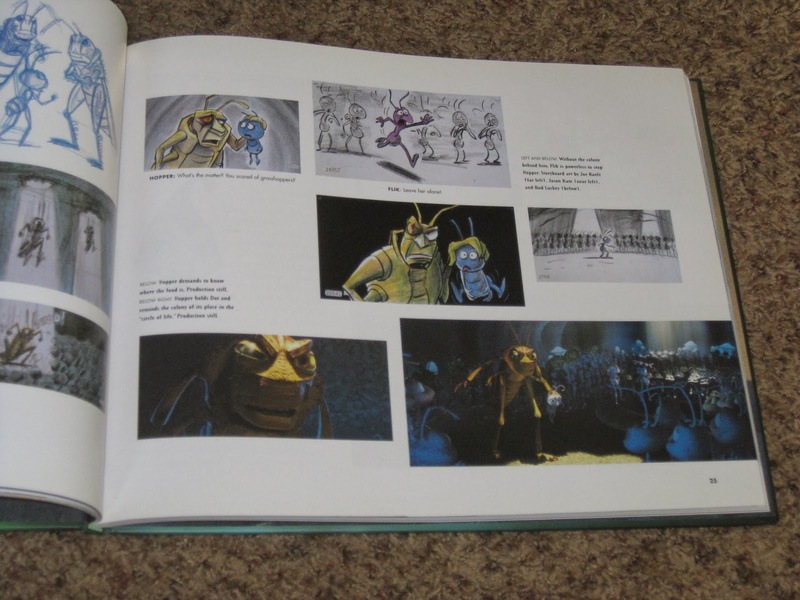 Here I've included just a few pictures of some of the pages you'll find within the book. I feel like, now that I've actually thought about it, A Bug's Life is probably the Pixar film that I know the least about the art and making of! My knowledge doesn't go too far beyond the special features included on the DVD/Blu-Ray. I just started reading it and have already learned and seen a ton I wasn't aware of! I'm looking forward to tackling this book from cover to cover and delving deeper into the making of this incredible, groundbreaking, classic film. As usual, I really can't recommend this book enough to you Disney/Pixar fans-especially if you collect the other "Art of" books. You won't be disappointed and you'll learn a ton! If you're visiting my blog for the first time today, welcome and thank you for stopping by! Be sure to check back daily to see more posts of items from my Pixar collection. In addition, you can learn more about me and my love for Pixar by clicking on the pages above. See you soon!